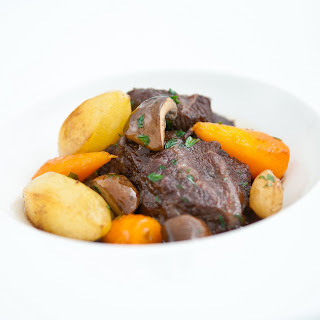 This is a classic French braised beef dish, it may seem a bit complicated but the beauty of this dish is that everything can be cooked in advance and just reheated in the oven when you wish to serve making it a great dish for a dinner party. Try to use a good quality red wine and stock as this will make the end result taste superior. Serve with mash for a complete meal. And pour over the beef. Leave to marinade for 24 hours. Toss the beef in the marinade as often as possible to insure an even coating. Heat the olive oil in a large tray and add the shallots, cook until starting to colour then add the bacon and cook for a further 5mins. Drain the beef from the marinade and fry in batches in frying pans until all browned. Place the beef on top of the shallots and bacon and pour over all of the marinade, season and add the tomatoes and the orange juice and rind, pour over enough stock to cover. Cover with foil and place in the oven. Cook at 150c for 1.5 hours or until the meat is tender, remove the foil and add the carrots and potatoes. Cook for a further 30mins or until the meat is tender enough to cut with a spoon.